With my next Open University course on fossils due to start mid November, I have borrowed a couple of books on the subject from my local library, just to whet my appetite. One is the book of the recent BBC TV series 'Fossil Detectives' and the other, 'Fossils of the World' by Turek, Malek and Benes, which is a much more academic book than the other. They will both prove useful in different ways in the coming months I think. One of the first passages that I read in 'Fossil Detectives' suggested that when you start out in the world of palaeontology, you never forget that first fossil find. Well, I have only recently begun to look into the subject and have never actually found one at all myself, so feel a bit miffed! Anyway, during my lunch break last week I happened to mention to a colleague of mine that I was going to have a stab at doing the OU course, 'S193 - Fossils and the History of Life'. He immediately opened his drawer and produced a handful of what looked to the untrained eye like shells that you might find on a beach. These were in fact fossils of a mollusc which abound in the car park where we work. Bizarre but true! A brief thumbing through 'Fossils of the World' easily identified these albeit slightly ropey specimens. They are in fact a fossil called Gryphaea arcuata, a mollusc from the Jurassic, i.e. 180 - 135 Ma. According to the natural history museum web site, this is a fairly common fossil but is particularly common to Suffolk, Gloucestershire and the Scunthorpe area, where the Lower Jurassic rocks were mined for their iron ore. Quite why so many of these fossils are lying in amongst other random pebbles and chunks of granite I've no idea. Maybe the dressing supplied to the company to decorate the borders is just a mix of waste rocks of about 2 -3 cm just thrown together. Anyway, this little chap consists of two pieces, being what I believe is called a 'bi-valve' - a curved left valve and a flat, lid-like right valve. I have only managed to find one example of the latter, seen at front left of the photo. The curved part of this little creature sat in the soft sediment with the lid above the surface. They are commonly called 'Devils Toenails' apparently, presumably because of their resemblance (with a bit of imagination) to toenails? Well, sort of . . . It seems amazing to me that even in these fairly poor quality specimens, there are distinct growth bands to be seen, which is remarkable for something up to 180 million years old and have most recently been churned up in sacks! But this is what is amazing. Looking at something that stems from something that lived millions of years ago, is pretty mind blowing. Well, mind blowing to me at least. I'm not sure the rest of my family quite understand the fascination - yet! So, there you go - my first fossil find! A bit of a cheat really, as they were rather handed to me on a plate! What I need next , is a genuine 'first', out in the field extracting a nice trilobite or ammonite from its rocky matrix. Proper palaeontology? All in good time eh? Before I go, I had a message posted up (see here) in response to my June post on the 'Geology of Charnwood'. The postee highlighted an innocent error on my part which I've corrected and highlighted my lack of acknowledgement of the source of my information. While I recognise that paraphrasing other peoples work and passing it off as ones own constitutes plagiarism in academic work, perhaps one should bear in mind what 'Holey Schist' actually is - a humble blog! A serious piece of academic work it ain't! I have and always will acknowledge my sources of text and photos, when I deem it sensible, but please remember folks, these are just the casual ramblings of a wannabee geologist - no more, no less! Education is a wonderful thing, particularly when one feels inspired to learn for its own sake, rather than at the start of that quest for a vocation. Having 'dipped my toe' in the educational waters earlier this year, I have felt a little lost since it all ended in June! Time to get back in the saddle I think, so I have enrolled on 'S193: Fossils and the History of Life'. This is a short 10 point Level 1 course which should be a useful introduction to the subject and build on what I learnt on the previous course. It will set me up nicely either for the MGeol course at Leicester or be another 10 points towards an OU Geosciences degree, whatever I choose to do. Leicester is the ultimate goal but such are the financial implications, it may well prove out of reach. We'll see, but what is important is that I keep studying, learning and growing as a human being. The quest for knowledge is what keeps one 'alive' I think. If we're not learning anything, what is the point of it all? Anyway, going back to a book I mentioned last time - 'Life After Us' by Jan Zalasiewicz, ironically, a lecturer at Leicester University. I've often wondered how our planet would react to the disappearance of us humans. What, if anything, would remain millions of years from now to show future inhabitants of Earth that an intelligent life form once existed in the past? We like to think man's miracles of engineering will survive long into the future, but in reality, what will last longer than say a few hundred years? In 'Earth After Us', Zalasiewicz gives us his take on what evidence we are likely to leave behind for some alien visitors to discover 100 million years from now. What evidence will there be for such structures as roads and motorways, 100 million years from now? A thin layer of rock with traces of hydrocarbons, found in long narrow lines over hundreds of miles? What evidence will there be for them to deduce that this former dominant lifeform on Earth propelled itself across its surface by some form of powered transportation? And what about fossilization of humans? I've always quite fancied the idea of being fossilised for some future life on Earth to find me million years from now! But then, as my daughter Aimee frequently tells me, I'm 'weird'! But how could this immortality be achieved? Most fossilisation occurs in shallow marine environments and it seems to take something exceptional for preservation in other environments to occur. So I won't hold out much hope there! One heartening thought raised by Zalasiewicz is the fate of those millions of tonnes to human detritus buried on landfill sites. All those supermarket shopping bags, shampoo bottles and innumerable plastic containers thoughtlessly dumped, buried and forgotten about. Out of sight . . .? Well, perhaps millions of years from now, after subsequent buriel under layers of fresh sediment and in the right circumstances, these former hydrocarbons may once again be transformed by pressure and heat to form once again, oil and gas reserves for future life forms to exploit! The ultimate in recycling perhaps! Hopefully, if this were to happen, these future beings will use it somewhat more wisely than we have done. All in all, a fascinating and thought provoking read. It was interesting to see on the books cover, an interpretation of what Earth may look like 100 million years from now rather like Ron Blakey's maps (see the link elsewhere in this blog site!). However, Zalasiewicz says in his book, "unfortunately, we cannot predict where the Earth's continents will be in one hundred million years time". He believes there are so many uncertainties that "detailed prediction becomes useless". I'm not sure I agree with that. Surely there's always room for prediction whatever the variables? In fact, in 'Ancient Landscapes of the Colorado Plateau', Blakey and Ranney present a suggestion as to what the Earth may look like for exactly this time period! I'll delve more into this latter book next time! Save the World? I don't think so! Apologies again for the break in service to my dear blog, but such is life these days! Anyone who has read a few of my blogs this year will realise how 'challenging' things have been for my family since the turn of the year. It's been a little crazy, but there's light at the end of that tunnel at last. Maybe time to start enjoying life again at a more sensible pace? Throughout the turmoil I have at least managed to find a few minutes to read a few interesting books to build on my OU science course and keep the grey matter functional. I've read 'Life after Us' by Jan Zalasiewicz and most recently 'The Revenge of Gaia' by James Lovelock. I'm now onto 'Ancient Landscapes of the Colorado Plateau', by a guy who has had way too many mentions from 'Holey Schist' already, but more of that excellent book soon! 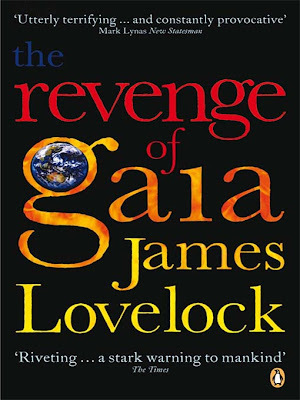 So to get back into the swing of things, I'll start with a brief look at Lovelock's 'Revenge of Gaia'. Finding this book (ironically via a reference in 'Life After Us') was particularly interesting as the author takes the view that planet Earth is like a living organism, self-regulating and capable of looking after itself on a constant basis, which is a view I share. Barely a day goes by without someone teling us what steps we need to take to 'help save the Earth'. Well meaning suggestions I'm sure, but are we not being a little arrogant to suggest that we humans can indeed 'save the Earth'? Dr Iain Stewart of Plymouth University stated in his excellent book and television series 'Earth: The Power of the Planet', that the Earth is quite able to look after itself and is indeed already doing so! A multitude of extremely clever feedback mechanisms help restore the Earth's natural balance. Lovelock however strikes a cautionary note, warning that if human activity tips the balance too far, we may reach a point where the Earth's natural feedbacks are unable to cope, leaving our planet heading for excessive warming to the point where life will no longer be possible. The thought of Earth becoming like some of our neighboiurs in the solar system is a sobering one and one not to be ignored. Lovelock also argues the case for nuclear energy in a very persuasive way. Indeed, sitting on a bench in Skegness last weekend, looking out to sea and being confronted by the sight of 54 wind turbines just off the coast, I couldn't help but wonder at the futility of it all! Is this a genuine alternative source of energy to replace fossil fuels, or is it merely to achieve european community goals for carbon dioxide emission reduction? If we surround our coast and cover our hillsides with these huge turbines (which we surely must if we are to replace coal and oil fired electricity generation), can we be sure that their very presence is not going to adversely affect our climate themselves? Unlike Lovelock, I don't believe that his nightmare scenario will come to fruition. Earth will find a way and restore its natural balance, but the downside I believe will almost certainly mean the extinction of us homo sapiens. How soon this happens will be largely down to how bold we can be to take the necessary steps to slow our and the Earth's decline. Can we voluntarily slow our population growth to achieve a more sustainable global level? A population of 8 billion cannot be sustained based on fossil fuel consumption or any other fuel for that matter, so something has got to give. Throw into the mix the small matters of water supply and food supply and things start to lookvery serious. And the alarming thing is that it may well come to a head in my lifetime - and I'm nearly 50! Scary! Iain Stewart ended his book with the optimistic view that the Earth will be okay. It will take care of itself very nicely thankyou, but just how long the human being will play a part is very much open to debate. 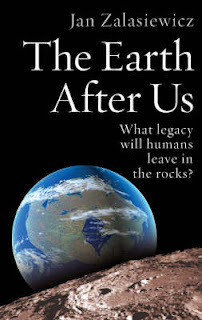 This all leads very nicely onto the other book I mentioned earlier, 'The Earth After Us' by Jan Zalasiewicz, which looks at Earth 100 million years from now, long after the human being has become extinct. What evidence will there be for the presence of homo sapiens? How will we be judged? Intriguing stuff and more on that next time!